Renault Trucks Defense delivers the first tactical fuel trucks to the French army. Renault Trucks Defense (RTD), the winner of a tender of French Army Fuel Service SEA (Service des Essences des Armees), delivered first vehicles that will undergo several state tests in order to be qualified. The subject of the tender are tactical fuel trucks that can be transported by air CCPTA (Camion Citerne Polyvalent Tactique Aerotransportable). 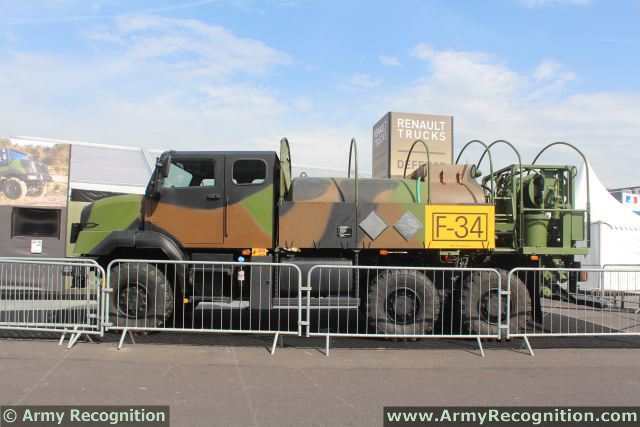 Renault Trucks Defense tactical fuel truck at Paris Air Show 2013. One of these vehicles was presented during the 50th Paris Air Show at Le Bourget exhibition from June 17th to 23rd, 2013. As a reminder, these refueling trucks with their tank capacity of 5m3 and the high mobility of the Sherpa Medium 6x6, will enable the refueling of all types of aircraft, including unmanned aircraft systems in rough terrain. RENAULT TRUCKS Defense develops and manufactures a full range of armored, tactical and logistic vehicles from 7.9 to 42 tons. It is a legacy supplier of the French armed forces with almost all the trucks in service and numerous armoured vehicles. It also supplies the complete 8x8 driveline of the French Army's 630 VBCI infantry fighting vehicles and the special chassis of the CAESAR 155 mm self-propelled howitzer. Renault Trucks Defense's customer portfolio also includes more than 65 other countries worldwide. 5000 VAB Mk1 APCs have been sold worldwide so far, whereas new models such as the Sherpa Light 4x4 tactical vehicle have already secured their first export contracts.